Three Musicians was originally written for english horn, french horn, and bass in the summer of 1989 at the request of Jacqueline LeClair, Gregory Evans, and Lisa Margosian, three young and able musicians interested in new music. In 2000, Jacqueline and I agreed that I should make a new version of the piece. The result amounts to a recomposition of the french horn and bass parts for bass clarinet and cello, respectively, with some alterations in the composition's rhythmic structure as well. The title also refers to the famous cubist painting of Picasso of the same name, particularly well-known to collectors of first-recordings of new music. 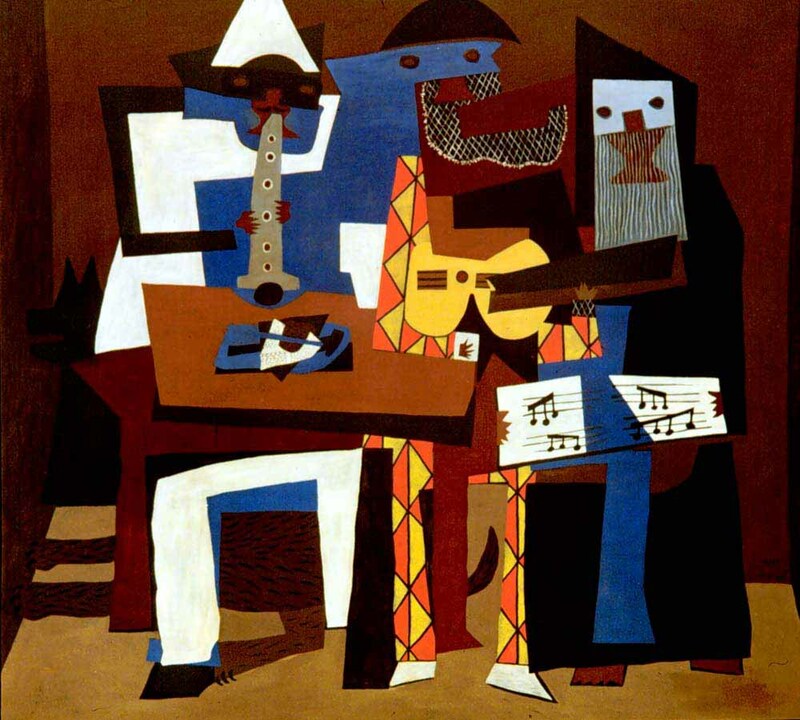 I happened to come across this painting when I was designing the piece in 1989, and I was struck by how Piccaso's interpenetration of his musicians' bodies and instruments formed a network of forms defying any one set of boundaries or figure-ground relations among the three musicians. For instance, irregular polygons of dense color both outline and unite parts of instruments, the hands and arms that play them, and the attendant music and music stands, fusing the three players into a tangled but balanced configuration. Of course, the painting's visual ensemble-relations suggest the graceful, formal, and intricate body language that results from the performance of any kind of chamber music, but to me it also vividly portrayed the way in which I had decided to structure the musical continuities in my yet uncompleted composition. In short, my musical materials were to be presented in a number of interlocking ways, so that only the entire ensemble of all instruments would resolve certain 'anomalies' in any single instrumental line.